You are likely familiar with my e-books on higher education, The Lean Professor for faculty and We Can Do It! for administrators. 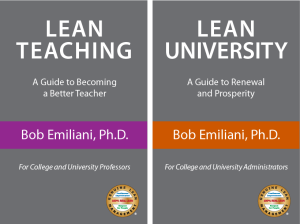 The books have been re-titled Lean Teaching and Lean University. Both books have been corrected, updated, and expanded. They are now available only in paperback, in response to many requests for that format and so that the images can be read more easily. Lean Teaching is printed in color and contains 48 informative images. These images help give readers a much better understanding of how I designed and delivered my courses over the last 15-plus years. It is your guide to the Lean teaching pedagogy. Lean University is printed in black-and-white and contains 15 images. It is intended for all levels of university administrators. It describes how to lead a Lean transformation in higher education and provides hundreds of important and helpful details. Administrators will find it to be a great help in assuring a smooth transition. I appreciate your support in telling your colleagues about these books. Thank you.